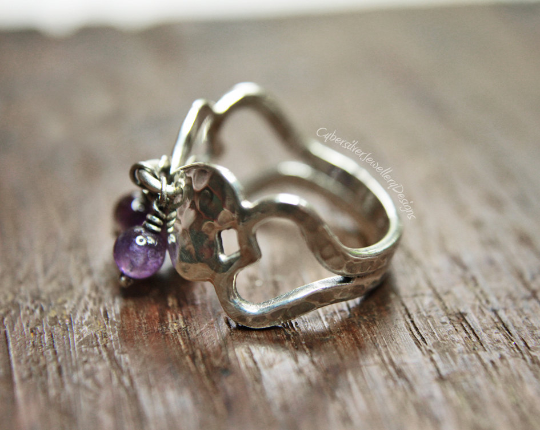 Entirely handmade, this silver heart ring is decorated with genuine amethyst beads and is a one-of-a-kind. The ring features two hearts, points touching, with heart outlines on either side. It has a double band and the silver has been textured and polished. Three genuine amethyst beads dangle from handmade head pins. Comes gift boxed - perfect for giving. 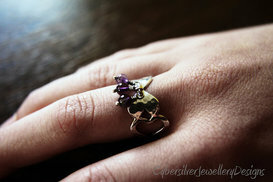 Amethyst is the birthstone for February and the stone traditionally given to celebrate the 6th year of marriage. Delivery - To ensure you receive your ring promptly and safely, I post UK Special Delivery or International Tracked and Signed. These are tracked, insured and signed-for services. Royal Mail will only insure precious jewellery using these delivery methods. As soon as I post, I will message you with your unique tracking number.